Some espionage writers follow the same character from one book to the next— John Le Carré’s George Smiley, for instance. 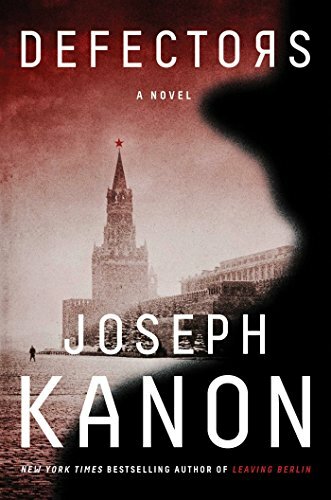 Others focus on the same time period as Joseph Kanon does with the Cold War. The juxtaposition of Le Carré and Kanon is intentional. While no one equals the British master, Kanon, beginning with his debut, Los Alamos, through The Good German, Stardust, Istanbul Passage, and Leaving Berlin, has carved out his own domain. Defectors might well be his best novel yet. Yes, on the surface, it traverses the spy genre landscape along with a authentically bleak Russian one. But Kanon has developed a rhythm and an atmosphere all his own, where men are not just action figures but intellectual ones, where style blends talk filled with pregnant ellipses and pointed description, where characters are as intriguing as plot. Just arrived is his brother Simon Weeks, a seemingly straight-arrow American publisher, once a cold warrior himself, who has been summoned ostensibly to edit Frank’s memoirs, which the Soviets are allowing to be published. He’s read the first draft and wants Frank to add more. But Frank has another, more dangerous collaboration in mind. After being in Moscow since 1948, and having been treated well by the Soviets, he wants to go home, and to bring his depressed, heavy-drinking wife Jo with him. Jo had a fling with Simon in the past, which neither has forgotten. Frank is determined to persuade Simon to help them. Simon is reluctant; Frank slowly reels his brother in as complications ensue. Frank and Jo have a minder in Boris, an apparatchik who enjoys his soft assignment s bartender, butler, fixer. “Friends” are largely other spies. The Americans include atomic-secrets traitors Hannah and Saul Rubin. The English contingent includes Gareth Jones, a gay ballet lover a British defector who arrived in the wake of the famous Cambridgians; his comrade Guy Burgess makes a cameo appearance. Then there is Hal Lehrman, a dogged UPI reporter, who makes runs to Helsinki with his wife to buy important items like American cigarettes and vegetables in winter. The push-pull between the brothers is compelling, even as nothing much happens besides a lot of vodka drinking, dining and strolls from homes to monuments to hotels in a city “gray with menace.” “It ages you, this place. The cold. Nobody to see . . . It’s a very stick-to-yourself town. At least for people like us,” says Gareth ruefully. When an unplanned murder occurs, Frank’s timetable for defecting again speeds up and the action moves into high gear. Defectors becomes a more typical spy story, with bodies and border dashes. At this point, there is no turning back, either for the Weekses or the reader. It is a satisfying stay-up-past-your-bedtime thriller. It is also a very fine novel, no genre qualifier needed.